Detective Steven Walker is attempting to identify the female pictured below in this correspondence. 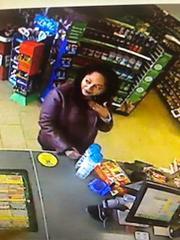 She is a person of interest in an active investigation and there is limited information at present. If anyone recognizes this female or has any information please contact OTPD Criminal Investigation Bureau, Detective Steven Walker.